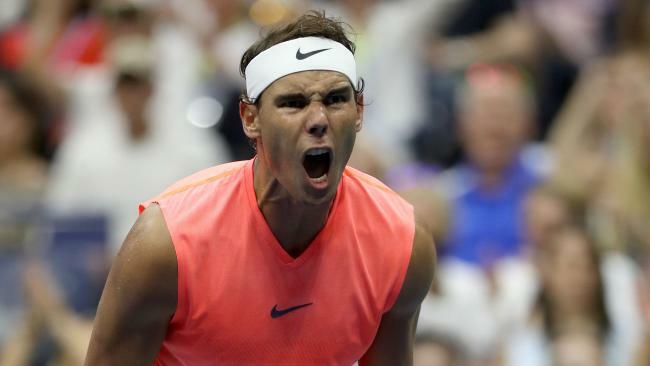 RAFAEL Nadal has survived a four-hour examination by Karen Khachanov to keep the defence of his US Open title just about on track. The world No.1, who had his right knee strapped at the end of the first set, looked in serious trouble when Russian Khachanov served for a two-set lead in the third-round clash. But Nadal proved just good enough when it counted and clinched a 5-7 7-5 7-6 (9-7) 7-6 (7-3) victory after four hours and 23 minutes. The good news for Nadal, who next meets Nikoloz Basilashvili, after the Georgian's 6-3 6-4 1-6 7-6 win over Guido Pella, is he survived on a day when he struggled to find his rhythm and clearly was not feeling physically at his best. "It has been a tough situation, a great opponent. I'm very happy to be through. Probably there's things to work on for the next match but the victory means I have the chance to do it," Nadal said. The Spaniard had difficulty to start defending against the 1.98m Russian's power game. Nadal lost the first set 7-5 and came under serious threat of losing the second but evened the score after a pause in play to close the roof on Arthur Ashe Stadium because of light rain. He went on to win the set 7-5. He was quickly down 3-1 in the second set before battling back to 4-4. Khachanov then cracked when serving for a two sets lead with the pair back on serve at 5-5. The top seed and defending champion needed a tie-breaker to win the third and fourth sets. In the last of the two, he pulled away early to seal the win. The man Nadal beat in last year's final at Flushing Meadows, No.5 Kevin Anderson, got through his own tough test against an up-and-coming opponent, edging No.28 Denis Shapovalov 3-6 6-4 6-4 4-6 6-4. Anderson will next play Dominic Thiem, who survived another lengthy match to beat American Taylor Fritz 3-6 6-3 7-6(5) 6-4 in three hours, 19 minutes. Stan Wawrinka, the 2016 champion, was defeated by 25th seed Milos Raonic 7-6(8-6) 6-4 6-3. Raonic goes on to fourth-round clash with American John Isner, who beat Dusan Lajovic 7-6 (10-8) 6-7 (6-8) 6-3 7-5. Borna Coric defeated Daniil Medvedev 6-3 7-5 6-2 and next faces third seed Juan Martin Del Potro, who beat Fernando Verdasco 7-5 7-6(6) 6-3 in the final match of the night.